During these winter days, I appreciate the early- to mid-winter blooming plants that brighten even the rainiest of days. 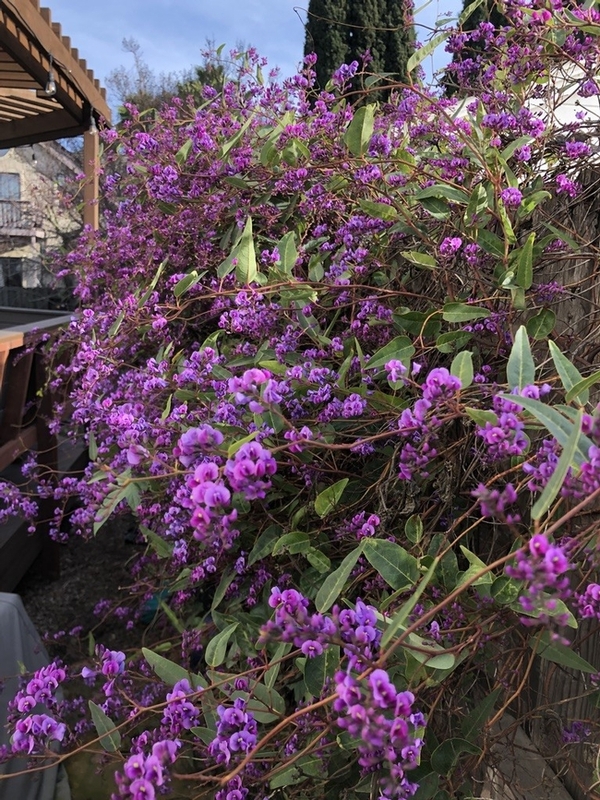 One of my favorite winter bloomers is a purple vine that I'm sure you've seen blooming in your neighborhood: the 'Happy Wanderer' vine, Hardenbergia violacea. This hardy, evergreen vine explodes with clusters of cascading pinkish-purple flowers from winter to early spring. 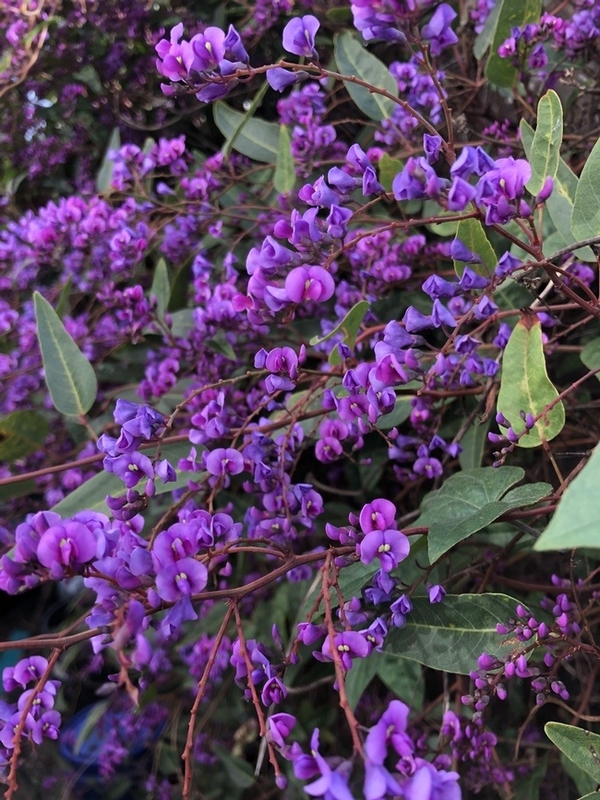 Hardenbergia violacea is an evergreen vine that is native to Australia. The flowers are shaped like sweet pea flowers with tiny bright green “eyes.” The simple leaves are dark green, narrow, and approximately 2-4” long. The vine grows at a moderate rate with twining stems to at least 10 feet. Some sources say that the plant can reach 16 feet. Regardless, it is vigorous and needs to be placed in an appropriate location for its ultimate size. The vine needs support for climbing and should be cut back after blooming to prevent tangling. 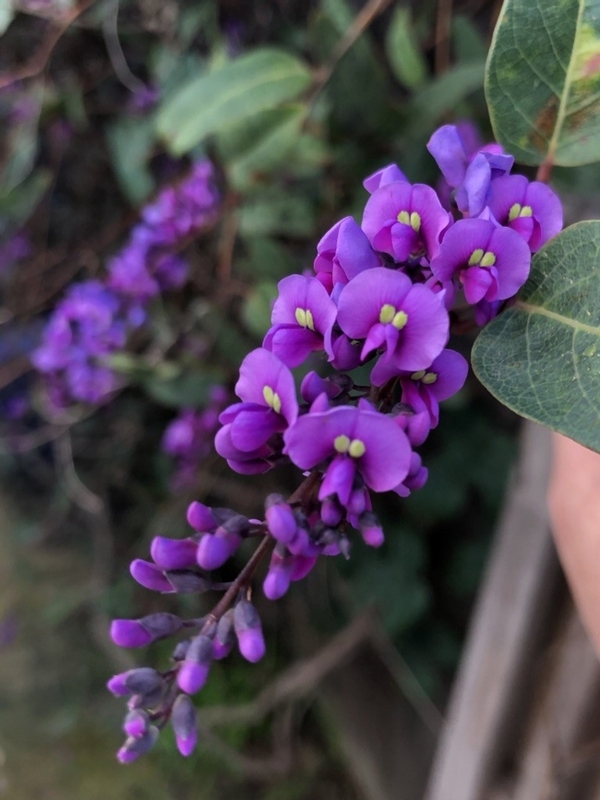 Selections of Hardenbergia are available in a few other colors, including pink (‘Rosea') and white (‘Icicle'). Plant Hardenbergia in sun or in light shade in hot inland areas. It prefers light soil, but it can tolerate heavy soil as long as the soil drains well. It requires little to moderate water once established. It is hardy to about 23° F, but can experience severe damage below 20° F.
In my experience, Hardenbergia can take tough conditions. I've grown the vine off and on for over fifteen years. I currently have a plant growing against a fence in a narrow side yard that only gets a few hours of sun and is subject to the gale force winds blowing off the Carquinez Strait. It isn't overly aggressive like some vines are and so it doesn't devour the fence. Despite my efforts to amend the soil, I'm pretty sure the vine is residing in clay soil. Nonetheless, it is happy and gorgeous! In the past, I've ripped out the plant when it became too woody, probably because I hadn't pruned it enough (or correctly). But by winter the next year, when I saw the cheery bright blooms around town, I regretted my decision and made plans to replace it. I'm glad I did! Hardenberegia "White Out' is a pretty variety too.